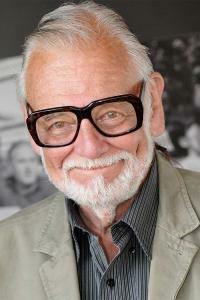 George Andrew Romero is an American-Canadian film director, producer, screenwriter and editor. He is 6' 5" (1.96 m) and was born on February 4, 1940 in New York City, New York, USA. He is from Cuban and Lithuanian descent. His father was a commercial artist, and his mother is Lithuanian-American. He is famous for his series of gruesome horror movies about zombie apocalypse like Night of the Living Dead (1968). He began making movies when he was 14 years old with an 8mm camera. His favorite horror movies as a child was The Thing from Another World (1951) and The Red Shoes (1948). He was inspired to become a director after watching The Tales of Hoffmann (1951). George and Tom Savini (stuntman, actor, special-effects artist, director) are good friends that have worked on many movies together. He began shooting short films, promotional featurettes, industrial training films and commercials after graduating in 1960 from Carnegie-Mellon University in Pittsburgh, Pennsylvania. One of his commercials was Mister Rogers' Neighborhood which also inspired him to direct horror films . He formed Image Ten Productions in the 1960s with nine friends. They all contributed about US $10,000 a person to make black and white American horror movie Night of the Living Dead (1968). The movie was directed by George and co-written with John A. Russo, earned more than it cost to make. The movie is about recently deceased people that were brought back to life by radiation. A group of non-zombies are trying to escape the flesh eating zombies by hiding inside an old farmhouse. He made three movies; There's Always Vanilla (1971), Jack's Wife / Season of the Witch (1972) and The Crazies (1973) after Night of the Living Dead. Those three movies were not very popular. George made Dawn of the Dead in 1978 with a $500,000 budget. It made over $55 million worldwide, and he made his third movie Day of the Dead in 1985. He was named one of the top cult film makers in 2003 Entertainment Weekly. He also made Knightrider in 1981 which is a classic to many people. He was married to Nancy Romero from 1971 to 1978. After their divorce, he met Christine Forrest on the set Season of the Witch and married her in 1981. They have three children together. Two of his children attended Tisch, NYU in 2006 to study filmmaking. His daughter is Tina Romero (actress, writer, director), and his son is George Cameron Romero. His son is a producer, director, writer, actor, editor and cinematographer. Christine and George are divorced. He met Suzanne Desrocher on the set of Land of the Dead and married her in September 2011 on Martha’s Vineyard. He resides in Toronto, Ontario with his family and became a Canadian citizen in 2009 with his U.S Citizenship. - Night of the Living Dead (1968), made the prestigious National Film Registry of the Library of Congress. - Awarded at Spike TV's Scream 2009 with a Mastermind Award. "It was the filmmaking, the fantasy, the fact that it was a fantasy and it had a few frightening, sort of bizarre things in it. It was everything. It was really a movie for me, and it gave me an early appreciation for the power of visual media—the fact that you could experiment with it. He was doing all his tricks in-camera, and they were sort of obvious. That made me feel that, gee, maybe I could figure this medium out. It was transparent, but it worked."